The University of North Carolina at Wilmington first opened its doors in the fall of 1947 as Wilmington College, a county-supported junior college. Classes had begun a year earlier as part of the General Assembly's plan to accommodate rising enrollment caused by returning veterans. One of 14 such temporary regional institutions that operated under the Extension Division of the University of North Carolina, Wilmington College continued to operate as a junior college under the auspices of the New Hanover County Board of Education. In 1957 the General Assembly passed the Community College Act, and Wilmington College became one of the first three community colleges in the state. By 1961 it had become a four-year institution. In 1969 Wilmington College joined the consolidated University of North Carolina System and became the University of North Carolina at Wilmington. It began offering graduate degree programs in 1977 and was designated a Comprehensive Level 1 university in 1985. 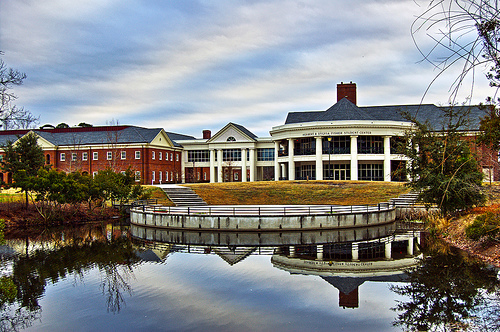 The modern University of North Carolina at Wilmington occupies a 661-acre tract of land with 70 buildings. It has a combined enrollment of more than 10,000 undergraduate and graduate students and ranks fourth highest in the UNC system for average freshman SATscores. The university has moved away from its early emphasis on vocational training and now offers degrees from the College of Arts and Sciences; the Schools of Business, Education, and Nursing; and its renowned program in marine biology at the Center for Marine Science Research. It also offers a Ph.D. in marine biology, one of only two such programs on the East Coast. Herbert and Sylvia Fisher Student Center at the University of North Carolina Wilmington. Image courtesy of Aaron Alexander. Available from http://www.flickr.com/photos/asalexander/3179747964/ (accessed November 19, 2012). 1 January 2006 | Stinson, Craig M.
I was a baby August 19, 1953 and would love to know who or what happened to the nurses that took care of me as an infant. Is there any record of the staff during that period? Thank you for any help you can give me.